Walk into any nursery, florist, or supermarket, and you’ll encounter displays of dozens of gorgeous flowers, from chrysanthemums to orchids. At one time these fanciful blooms were the rare trophies of the rich and influential—even the carnation, today thought of as one of the humblest cut flowers. Every blossom we take for granted now is the product of painstaking and imaginative planning, breeding, horticultural ingenuity, and sometimes chance. 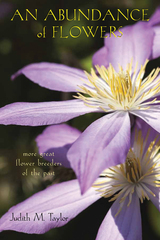 The personalities of the breeders, from an Indiana farmer to Admiral Lord Gambier’s gardener, were as various and compelling as the beauty they conjured from skilled hybridization. In Visions of Loveliness: Great Flower Breeders of the Past, Judith Taylor wrote engagingly about the vivid history and characters behind eighteen types of popular flowers. In this companion volume she uncovers information about another eight familiar flowers: poinsettias, chrysanthemums, gladioli, pansies, carnations, water lilies, clematis, and penstemons. Taylor has tapped into an enormous trove of stories about extraordinary people with vision and skill who added to our enjoyment piece by piece, starting about 150 years ago. This beautifully illustrated book will please flower enthusiasts, gardeners, and history buffs alike. The publication in 2009 of Mark McGurl’s The Program Era provoked a sea change in the study of postwar literature. Even though almost every English department in the United States housed some version of a creative writing program by the time of its publication, literary scholars had not previously considered that this institutional phenomenon was historically significant. McGurl’s groundbreaking book effectively established that “the rise of the creative writing program stands as the most important event in postwar American literary history,” forcing us to revise our understanding not only of the relationship between higher education and literary production, but also of the periodizing terminology we had previously used to structure our understanding of twentieth-century literature. After the Program Era explores the consequences and implications, as well as the lacunae and liabilities, of McGurl’s foundational intervention. Glass focuses only on American fiction and the traditional MFA program, and this collection aims to expand and examine its insights in terms of other genres and sites. Postwar poetry, in particular, has until now been neglected as a product of the Program Era, even though it is, arguably, a “purer” example, since poets now depend almost entirely on the patronage of the university. 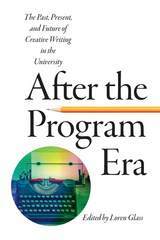 Similarly, this collection looks beyond the traditional MFA writing program to explore the pre-history of writing programs in American universities, as well as alternatives to the traditionally structured program that have emerged along the way. 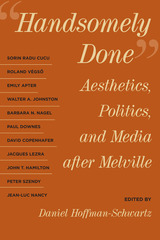 Taken together, the essays in After the Program Era seek to answer and explore many of these questions and continue the conversations McGurl only began. In 2009 Alaska celebrates its fiftieth anniversary of U.S. statehood. To commemorate that milestone, Alaska at 50 brings together some of today’s most noteworthy and recognizable writers and researchers to address the past, present, and future of Alaska. Divided into three overarching sections—art, culture, and humanities; law, economy, and politics; and environment, people, and place—Alaska at 50 is written in highly accessible prose. Illustrations and photographs of significant artefacts of Alaska history enliven the text. Each contributor brings a strong voice and prescription for the next fifty years, and the resulting work presents Alaskans and the nation with an overview of Alaska statehood and ideas for future development. During the 1990s and early 2000s in Europe, more than fifty historical commissions were created to confront, discuss, and document the genocide of the Holocaust and to address some of its unresolved injustices. Amending the Past offers the first in-depth account of these commissions, examining the complexities of reckoning with past atrocities and large-scale human rights violations. 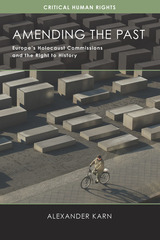 Alexander Karn analyzes more than a dozen Holocaust commissions—in Germany, Switzerland, France, Poland, Austria, Latvia, Lithuania, and elsewhere—in a comparative framework, situating each in the context of past and present politics, to evaluate their potential for promoting justice and their capacity for bringing the perspectives of rival groups more closely together. Karn also evaluates the media coverage these commissions received and probes their public reception from multiple angles. Arguing that historical commissions have been underused as a tool for conflict management, Karn develops a program for historical mediation and moral reparation that can deepen democratic commitment and strengthen human rights in both transitional regimes and existing liberal states. This collection of essays highlights the “peculiarly American” issues of public administration ranging from 1870 to 1974, when they were first published. Every contributor was assigned a period of American history and given the opportunity to write on what he or she deemed the most important or relevant concern of that period. This method, employed for this book and the connected National Association of Schools of Public Affairs and Administration conference, resulted in a wide-reaching, if eclectic, collection. Supplanted by Mosher’s impressive summarization of the field throughout the years, the book still holds prominence as a source for scholars, workers, and students alike in public administration. 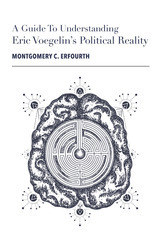 The essays raise such issues as the education of civil servants, the changes necessitated by crises, the growth of social sciences in governmental concerns, and primarily, the role of public administrators in America. Each author is a distinguished expert in his own right, and each essay can stand alone as a remarkable insight into the changing world of public administration within American society. 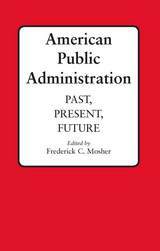 Frederick Mosher’s expertise and supervision shapes this work into a remarkable and holistic perspective on public administration over time. In this fascinating book, Terry O’Connor explores a distinction that is deeply ingrained in much of the language that we use in zoology, human-animal studies, and archaeology—the difference between wild and domestic. For thousands of years, humans have categorized animals in simple terms, often according to the degree of control that we have over them, and have tended to see the long story of human-animal relations as one of increasing control and management for human benefit. 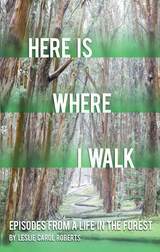 And yet, around the world, species have adapted to our homes, our towns, and our artificial landscapes, finding ways to gain benefit from our activities and so becoming an important part of our everyday lives. These commensal animals remind us that other species are not passive elements in the world around us but intelligent and adaptable creatures. 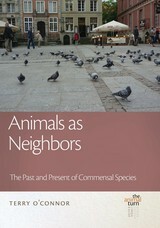 Animals as Neighbors shows how a blend of adaptation and opportunism has enabled many species to benefit from our often destructive footprint on the world. O’Connor investigates the history of this relationship, working back through archaeological records. By requiring us to take a multifaceted view of human-animal relations, commensal animals encourage a more nuanced understanding of those relations, both today and throughout the prehistory of our species. Compiled by four sisters and based on their recollections of their childhood in Oshkosh, Wisconsin, Apple Betty & Sloppy Joe captures the glow of memories formed while growing up in a midwestern kitchen. From Lemon Meringue Pie to Tomato Soup Cake, from Mom's Chicken Pie to Grandma Noffke's Sliced Cucumber Pickles, this charming book features hundreds of recipes (some classic, some quirky), plus dozens of food and cooking-related anecdotes, memories, humorous asides, and period photos that transport readers back to Mom's or Grandma's kitchen, circa 1950. The Sanvidges share a legacy of beloved dishes and food memories that resonate not just for their family, but for readers everywhere who grew up in a small midwestern town - or wish they had. Nostalgic, funny, and warmhearted, Apple Betty & Sloppy Joe celebrates the ways food and food memories link us to our past, and to each other. A delightful gift for food lovers of any generation. In this innovative work, Julia King moves nimbly among a variety of sources and disciplinary approaches—archaeological, historical, architectural, literary, and art-historical—to show how places take on, convey, and maintain meanings. Focusing on the beautiful Chesapeake Bay region of Maryland, King looks at the ways in which various groups, from patriots and politicians of the antebellum era to present-day archaeologists and preservationists, have transformed key landscapes into historical, indeed sacred, spaces. The sites King examines include the region’s vanishing tobacco farms; St. Mary’s City, established as Maryland’s first capital by English settlers in the seventeenth century; and Point Lookout, the location of a prison for captured Confederate soldiers during the Civil War. As the author explores the historical narratives associated with such places, she uncovers some surprisingly durable myths as well as competing ones. St. Mary’s City, for example, early on became the center of Maryland’s “founding narrative” of religious tolerance, a view commemorated in nineteenth-century celebrations and reflected even today in local museum exhibits and preserved buildings. And at Point Lookout, one private group has established a Confederate Memorial Park dedicated to those who died at the prison, thus nurturing the Lost Cause ideology that arose in the South in the late 1800s, while nearby the custodians of a 1,000-acre state park avoid controversy by largely ignoring the area’s Civil War history, preferring instead to concentrate on recreation and tourism, an unusually popular element of which has become the recounting of ghost stories. As King shows, the narratives that now constitute the public memory in southern Maryland tend to overlook the region’s more vexing legacies, particularly those involving slavery and race. Noting how even her own discipline of historical archaeology has been complicit in perpetuating old narratives, King calls for research—particularly archaeological research—that produces new stories and “counter-narratives” that challenge old perceptions and interpretations and thus convey a more nuanced grasp of a complicated past. Julia A. King is an associate professor of anthropology at St. Mary’s College of Maryland, where she coordinates the Museum Studies Program and directs the SlackWater Center, a consortium devoted to exploring, documenting, and interpreting the changing landscapes of Chesapeake communities. 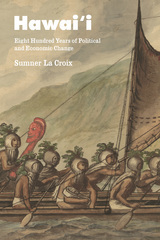 She is also coeditor, with Dennis B. Blanton, of Indian and European Contact in Context: The Mid-Atlantic Region. The Arrernte people of Central Australia first encountered Europeans in the 1860s as groups of explorers, pastoralists, missionaries, and laborers invaded their land. During that time the Arrernte were the subject of intense curiosity, and the earliest accounts of their lives, beliefs, and traditions were a seminal influence on European notions of the primitive. The first study to address the Arrernte’s contemporary situation, Arrernte Present, Arrernte Past also documents the immense sociocultural changes they have experienced over the past hundred years. Employing ethnographic and archival research, Diane Austin-Broos traces the history of the Arrernte as they have transitioned from a society of hunter-gatherers to members of the Hermannsburg Mission community to their present, marginalized position in the modern Australian economy. While she concludes that these wrenching structural shifts led to the violence that now marks Arrernte communities, she also brings to light the powerful acts of imagination that have sustained a continuing sense of Arrernte identity. In this lively and engaging book, Lisa Gail Collins examines the work of contemporary African American women artists. Her study comes at a time when an unprecedented number of these artists—photographers, filmmakers, painters, installation and mixed-media artists—have garnered the attention and imagination of the art-viewing public. To better understand the significance of this particular historical moment in American visual arts, Collins focuses on four “problems” that recur when these artists confront their histories: the documentation of truth; the status of the black female body; the relationship between art and cultural contact and change; and the relationship between art and black girlhood. By examining the social and cultural histories which African American women artists engage, Collins illuminates a dialogue between past and present imagemakers. The Art of History is a major contribution to the study of American visual culture. It will be of use to both scholars and students in art history, African American studies, American studies, and women’s studies. Authoring the Past surveys medieval Catalan historiography, shedding light on the emergence and evolution of historical writing and autobiography in the Middle Ages, on questions of authority and authorship, and on the links between history and politics during the period. Jaume Aurell examines texts from the late twelfth to the late fourteenth century—including the Latin Gesta comitum Barcinonensium and four texts in medieval Catalan: James I’s Llibre dels fets, the Crònica of Bernat Desclot, the Crònica of Ramon Muntaner, and the Crònica of Peter the Ceremonious—and outlines the different motivations for the writing of each. For Aurell, these chronicles are not mere archaeological artifacts but rather documents that speak to their writers’ specific contemporary social and political purposes. He argues that these Catalonian counts and Aragonese kings were attempting to use their role as authors to legitimize their monarchical status, their growing political and economic power, and their aggressive expansionist policies in the Mediterranean. By analyzing these texts alongside one another, Aurell demonstrates the shifting contexts in which chronicles were conceived, written, and read throughout the Middle Ages. The first study of its kind to make medieval Catalonian writings available to English-speaking audiences, Authoring the Past will be of interest to scholars of history and comparative literature, students of Hispanic and Romance medieval studies, and medievalists who study the chronicle tradition in other languages.